Downtown Valdosta Farm Days is a bi-weekly farmers' market featuring local farmers and artisans and also serves to educate the community about eating local, nutrition and food choices. There's a calendar on their website, along with how to become a vendor. No livestock. Local produce. Here's video of the first part of what she said. Yesterday I wrote that interactions about Valdosta Farm Days between the Lowndes Commmission and the City of Valdosta "could have been smoother if one or both of the parties had been proactive." 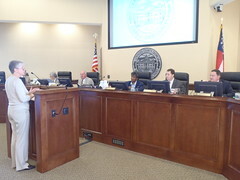 The VDT reported that the County Commission wants to know about Valdosta Farm Days, and apparently there was a disconnect between the staff and the Commissioners. Here's how the Commission came to be informed, through interactions of citizens and staff. At the Lowndes County Commission work session on Monday morning, County Manager Joe Pritchard distributed a map to the Commissioners from the Valdosta Main Street Manager, Amanda Peacock, detailing a proposal for a Farmer's Market on the sidewalk of the old County Courthouse.